From Obama to Trump: 180 Degrees or More of the Same?From Obama to Trump: 180 Degrees or More of the Same? 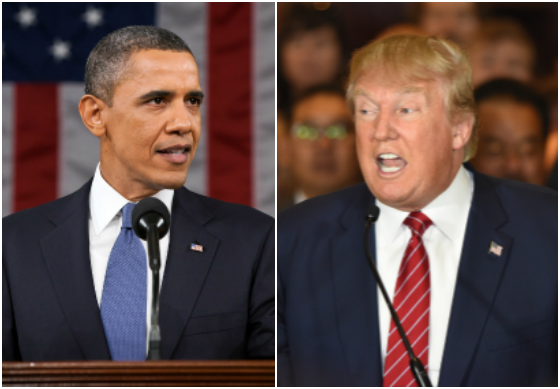 From Obama to Trump: 180 Degrees or More of the Same? This post is a blatant application of hindsight bias. We all now know that when Barack Obama won the election and subsequently took office, the economy was melting down and the financial markets were in a free fall around the globe. To refresh your memory, there was the bailout of AIG by the Fed, bailouts and conservatorship of Fannie Mae and Freddie Mac, the engineered sales of Bear Stearns and WaMu to JPMorgan and Merrill Lynch to Bank of America, TARP, unprecedented Fed action, and public outrage at Wall Street being bailed out while Main Street suffered. We were staring down the abyss. Pessimism was rampant, the bull market in capitalism was over and now a bull market in government was upon us as Paul McCulley so aptly summarized the situation unfolding. Stimulus, Dodd-Frank, Cash for Clunkers, the bailing out of GM at the expense of creditors and in favor of the UAW, the collapse of the unregulated shadow banking industry, Obamacare, a much more intrusive regulatory regime and government intervention in the economy, an emphasis on clean energy, and a somewhat apologetic America for having projected too much power and influence in the world and a willingness to be part of more global agreements like TPP and the Paris Climate Agreement became the new normal. And if this came at the expense of heady economic growth then so be it. The era of home ownership for all and the financialization of the economy was now coming to an end with the goal of creating safety and stability by the construction of government designed and controlled guardrails. My how have attitudes and policies seemingly changed now that we have Donald Trump as President guided by Steve Bannon. What follows is a list of some of the key differences between when Obama was elected and Trump’s victory. Some are already happening while others are attitudinal differences and others are still hoped for. According to a table on Marketwatch, the Dow Jones Industrial Average during Trump’s first 30 days in office has posted one of the strongest performances in its history. 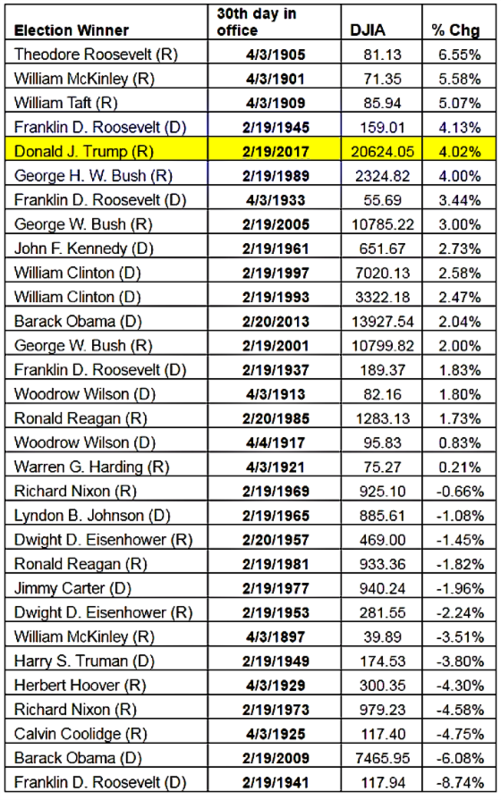 Trump’s Dow performance marks the fifth-best gain in history in percentage terms (in the first 30 days), according to Dow Jones data, and the third best such performance for a first-term president. Of course, we’re early in the game so time will tell how the Trump market will do over his full term in office. With 20/20 hindsight it turns out that the conditions present when Obama took office represented a tremendous buying opportunity, although the market didn’t bottom until early March of 2009. I can’t help but think the opposite may be the case with Trump. It is hard to argue a counterfactual but the market’s performance would seem to have suggested that Obama had an effective policy mix. Of course, the market was deeply depressed so initial conditions are extremely important in terms of future returns as will be shown shortly. The real test for Trump will be if economic growth accelerates and jobs and wages grow more rapidly than they did under Obama. Trump’s approach may be good for the real economy but not for the markets given his starting point. 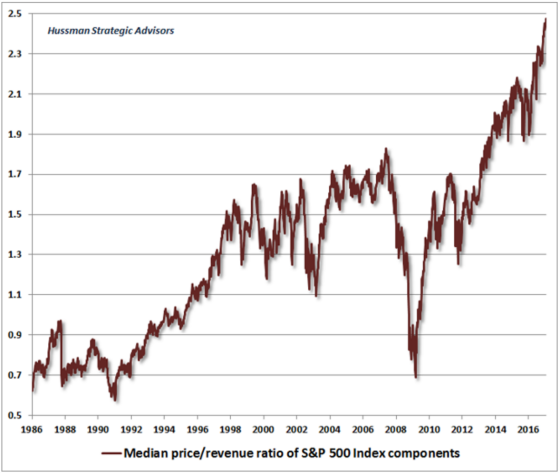 The following charts are from John Hussman, The first one shows how the median price relative to revenue is at very elevated levels and when Obama took over this ratio was at a very low level. Of course one can argue that the ratio should be high given how low interest rates have fallen and the gradually improving economy. Nevertheless, if the last 30 years is any guide, it would appear that valuations are stretched. 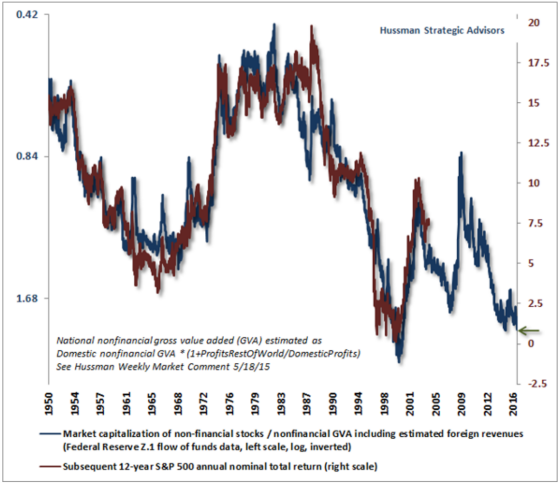 The second chart is one Hussman puts a lot of faith in. It takes the total market capitalization and compares it to a modified measurement of economic output and then compares that ratio to subsequent 12-year returns. The lower the ratio, the higher the future 12-year returns and vice versa. 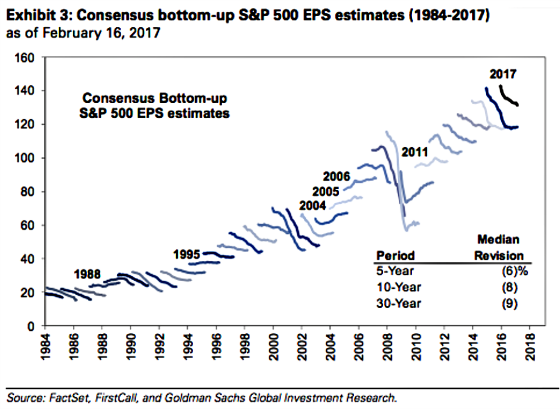 The following chart shows how the S&P 500 rally started when earnings were projected to rise modestly but now the estimates have dropped fairly dramatically. These downward revisions should not be surprising because this is the norm as the following chart shows. So what is going on? It’s entirely possible the market is far ahead of itself and now it is being fueled by sentiment versus fundamentals. Perhaps there is another reason. I’m going to propose a very contrarian and counterintuitive theory about Trump and the market. I’m not sure I truly believe it myself yet but I will put it out there. It seems like Trump is delegating foreign affairs to Mattis, Pence, hopefully, Tillerson as well as McMaster, to maintain a more traditional approach to our European allies, Japan, and NATO as well as a competitively cooperative relationship with China. He has talked tough about Iran but with Michael Flynn out and H.R. McMaster in we shall see what happens there. I see Trump asserting himself when there are black and white deals on the table and he thinks America can get a better deal which means fewer imports, more exports, and more manufacturing in this country. He can only see things in black and white terms and countries as winners and losers. Trump does not have the patience or temperament to be patient and strategic and lay the foundation and plant the seeds for initiatives that won’t bear fruit for many years. He will leave that to others. Trump hates being constrained by the checks and balances and politics of Washington. He is only comfortable campaigning, selling, and feeding off the energy of those who love him who despise the system that has evolved that they perceive as protecting and elevating the wealthy and out of touch elites who don’t care about American values and the forgotten man. This has led to a rentier, elitist system that is destroying the fabric of America. Feeding off this energy of true believers will reinforce Trump’s mentality that “he who is not with me is against me.” He will continue to espouse economic nationalist ideals because that is what his base wants to hear and Trump, in turn, wants to hear applause, adulation, and hero worship. So he will figure out what people want in order to have him be adored and then focus on those issues and talk to the people to make sure they still adore him. The nuts and bolts of long-term policy creation and the hard work that goes with it is too much in the weeds for him and not what his supporters desire to hear. They want to know he cares about them, feels their pain, and will fight for them. Trump will leave the messy aspects of the job to his foreign policy team and Congress. As a result of Trump’s focus on generalities versus details and hard work, Obamacare repeal and replacement is stalled and, according to John Boehner, changes to it will be relatively modest, regulatory burden reductions seems way too optimistic when he says 75% will be eliminated, and there is no coherent plan with regard to infrastructure at this point. In fact, Axios reports that the Trump administration is now considering pushing out delivering an infrastructure plan until 2018 and it has now been pared down to $550 billion from $1 trillion. And this seems to be the case with tax reform as well. 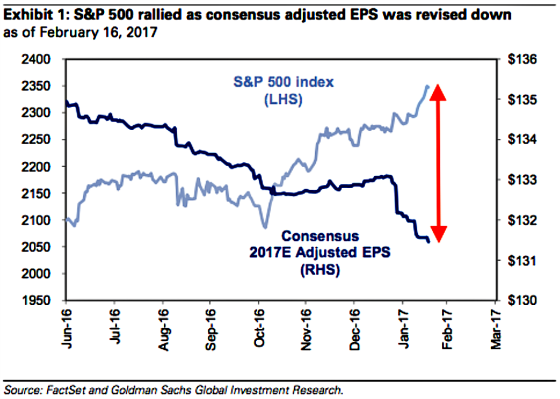 Goldman Sachs now believes that Obamacare will be so all consuming for Republicans that tax reform won’t take place in 2017. And if history is any guide then we may not get any meaningful tax reform as Al Hunt points out in a very insightful piece. The last major overhaul of the tax system took place in 1986 and it required very hard work and bipartisanship. The ideological divide is so great that Hunt is skeptical that the Republicans will be able to make it happen. On the international front Trump has backed away from revisiting the one China policy, Pence and Mattis spoke of their support for the E.U. and NATO, but Trump was able to push a “deal” that is black and white by demanding NATO countries step up for their 2% of GDP commitment for defense spending. By this point in his presidency, George W. Bush had announced the outline of a tax plan that, with modifications, he would sign into law a few months later. Barack Obama had signed the stimulus, a bill to expand the children’s health-care program, and the Lilly Ledbetter Fair Pay Act. President Donald Trump is having a slower start. He has not signed major legislation yet. The White House has not put out a legislative plan on three of Trump’s main campaign issues: health care, infrastructure, and tax reform. He has been slower in filling government positions than his predecessors, too. And the president’s highest-profile executive orders, on immigration, have been stayed by federal courts. He ends it by saying the following, which in some ways to speaks to my point that maybe we will have more of the same in terms of gridlock since he is not taking the lead to guide Republicans in Congress in terms of key tenants of key legislation. Trump is doing much less to set a direction for his party in Congress than we have seen in decades. That might be a good thing. Maybe Congress will adjust by doing more to set its own direction, as befits the branch of government to which Article I of the Constitution is devoted. But it will take some getting used to. For congressional Republicans, the problem with Trump may not be that he is an authoritarian strongman, as so many of his critics say. It’s that he is, by the standards to which we have become accustomed, a weak president. Or maybe he is not weak at all and is actually strong in that he knows what is important, which is winning in 2020, and he will do what is necessary to improve his chances of being victorious by saying what the people want to hear, talking to the people often, and leaving the rest up to his key advisors to handle the tough stuff and deliver the goods. To me, in many ways, it does feel like more of the same in that I don’t think much will get done and maybe that will be just fine. I would, however, tell Steve Mnuchin that if he thinks that the stock market is the report card of the effectiveness of the Trump administration’s economic policies, then it will not be looked upon very favorably if John Hussman’s forecasts are anywhere near accurate. Mnuchin should revisit his words and focus on outcomes for American individuals and families in terms of economic opportunity, health and well-being, and overall satisfaction. Maybe that has been the root of some of our country’s biggest problems over the past 30 years: We have looked to markets and asset values as the most important indicators of our economic well-being versus the lives of our nation’s citizens. Do you feel like more of the same or have we done a 180?